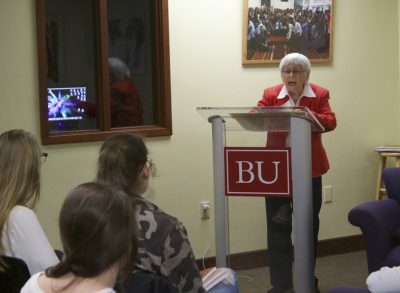 Members of the Boston University community gathered in the Howard Thurman Center on Thursday evening to listen to Holocaust survivor Esther Adler talk about her experiences being Jewish living in Germany during Adolf Hitler’s first few years in power. The gathering was one of seven Memory in the Living Room sessions set up by BU Hillel and the Elie Wiesel Center for Jewish Studies as a conclusion to BU’s recognition of Holocaust Remembrance Day. 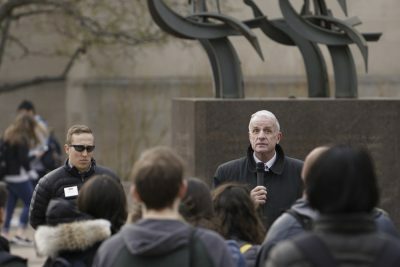 The sessions gave students an opportunity to meet with first- and second-generation Holocaust survivors in intimate “living rooms” around campus and learn from their experiences. Adler began the evening by saying she does not like to use the term Holocaust, but instead prefers to use the Hebrew name — Shoah. The idea to hold the Memories in the Living Room commemoration came from a student member of the BU Jewish Leadership Team, said Ethan Sobel, the assistant director of BU Hillel, before the gathering. Reflecting on the severity of the Holocaust is crucial to the process of learning and moving on, Sobel said. 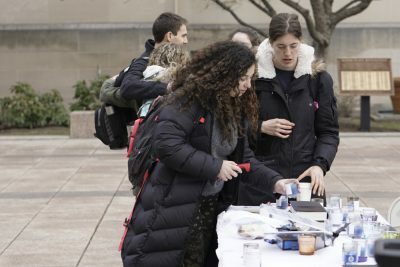 “It is very, very important for us to commemorate Yom HaShoah every year, to hear about the narratives of people who experienced the Holocaust and what they went through, what their lives have been like since and what lessons they have learned and what we can learn together from this tragic time in our history,” Sobel said. The discussions were held in small-scale, intimate spaces to allow for a more personal and dignified storytelling experience, said Michael Zank, the director of the Elie Wiesel Center. Much of Adler’s presentation focused on the increasing effects of the Nuremberg Laws on her community, which had a large population of both Polish and German Jews. “Wherever there was life, it was restricted,” Adler said. Also restricted were the opportunities for escape, Adler said. Immigration quotas imposed by different countries, including the United States and the United Kingdom, which at that time controlled what would become Israel, made it very difficult for families to emigrate. Adler said relatives in the United States arranged for her family to join them, but that the length of time it took to get into the United States would have killed them. Adler later shared a poem she wrote decades later while teaching in the United States. “Where can we go? Can we still flee? How can we know which land is still free? Did we wait too long in deciding to flee?” she read. The decreasing quality of life and her family’s Zionist connections would eventually persuade Adler and her family to split up and leave Germany individually, she said. The day after her 15th birthday, she left for a Zionist training camp, which would send her to Israel. Nicolette Matsangos, a senior in the College of Arts and Sciences, said she attended the discussion in part because of the power of a first-hand account from a survivor, especially in the current political climate. “Especially during World War II, you see sort of the worst of humanity but also the best of humanity — people like Esther and people who fought against what was happening [and] helped Jewish people,” Matsangos said. Connor McDonnell, a senior in the College of Engineering, said he attended Adler’s talk for the chance to put things in perspective, which he said made him feel thankful for everything he has. “[It’s important] just to not forget about what happened, to not minimize it [or] to devalue it,” McDonnell said. Neliya Glickerman, 22, of Israel, heard about the event from her uncle, whom he was visiting in Newton. He said he thinks it’s important for people to listen to survivors and remember what they went through while they still can.